My review of The Name of the Wind, The Kingkiller Chronicle: Day One can be found here. The following review contains the tiniest spoilers possible for The Name of the Wind. Picking up the tale of Kvothe Kingkiller once again, we follow him into exile, into political intrigue, courtship, adventure, love and magic . . . and further along the path that has turned Kvothe, the mightiest magician of his age, a legend in his own time, into Kote, the unassuming pub landlord. 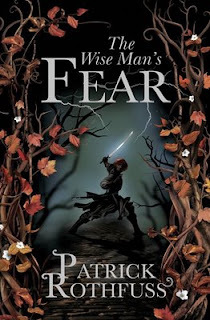 The Wise Man's Fear (The Kingkiller Chronicle: Day Two) is an excellent sequel to The Name of the Wind. It's just as incredibly well written as the first and I loved it. Most of the time. Just like the first book it suffers some very long rather dull paragraphs. Where most authors might just skip a time period saying "time passed, certain stuff happened", Rothfuss tells us what happens every. single. day. I love Kvothe. He's a brilliant character. I love Kote even more and I can't wait to find out what's going on. We aren't told exactly what, but everything is definitely not as it seems! I LOVE THIS AUTHOR. Amazing. I am anxiously awaiting my delivery so I can tear into the pages as well. This first book blew me away.